So, convention standards change. I get that. I'm not one for change, and usually I'm the last to jump on a new standard, or at least having to have someone fully explain the reason for the change before I take the plunge (but, if I understand and it makes sense I'll be the strongest proponent). Anyhow... over my tenure in the electronics realm I've seen many a change: component video to DVI to HDMI, line level RCA to digital coaxial to optical ... heck my old Palm Pilots used to have different connectors every year (anyone remember how 'Athena' was going to be THE standard?). In the past while I've lived in relative stability. My devices and accessories have all made use of the microUSB port to charge. All my bluetooth headphones, all my portable speakers ... everything. The joy of this was that I only had to worry about one cable. Get me a plugin and I'll have the cable. But times change. Items evolve. Now, aside from my latest phone, the Moto Z, having dropped headphone port (which I can totally live without and not blink), I have switched to USB-C. My G5 before it had the same. I get it. USB-C has more advantages over microUSB. I won't go into all the technical detail, because, quite honestly, I don't understand it, but it was explained to me by people smarter than I am. That doesn't make it any less painful to make the switch. Way back when, I remember having friends in the photography industry who told me of the pains when Canon had switched from their older FD mount to the EF series and how it angered a whole community who, if they wanted to grab a newer camera body, would have to lose access to their older accessories. It was a change that was needed tho'. I sort of feel the same now. There's part of me that wants to go and throw my old items in the garbage and get only USB-C versions. I've gone out and bought some cables, but they only work on my phone, so I'd have to have my other cable for microUSB items. It would make sense then. I would only need to carry around the USB-C cables. 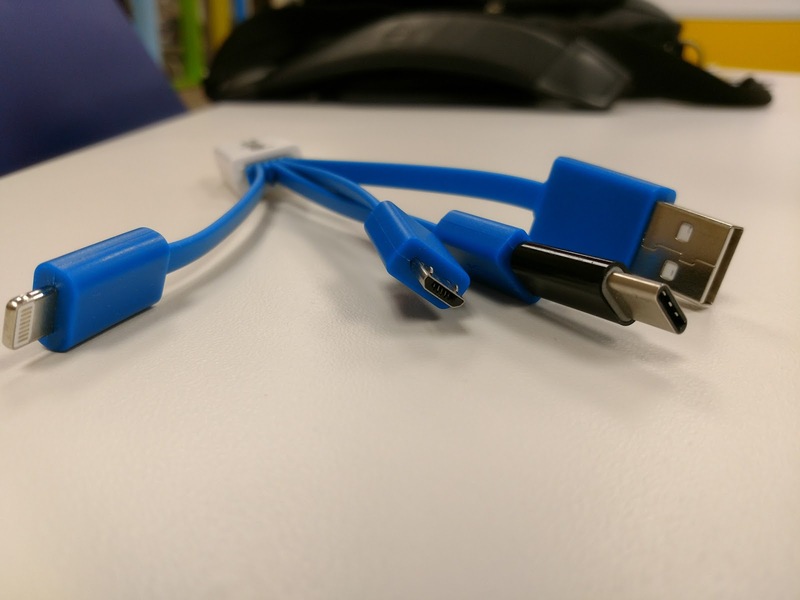 However; there are not many items that make use of the USB-C connection yet. ...yet! I can see the point of the manufacturer saying "well, only a couple phones use that style, and microUSB is prevalent and cheaper... so to switch we'd only be servicing a small portion of our clientele." Without getting USB-C port accessories the only option is to carry around adapters. I carry around a spare cord when I need it, but for the most part I'm holding on to my adapters. I reviewed some ICZI adapters a while back, and I leave those for home when I want an assured connection of reliable speed. While I'm out and about some cheaper options are used (see photo above). I don't want to put them in a bag and lose them. With the price, I can buy several and have them scattered about the locations in my life. In my laptop bag right now I have one attached to the little 'spider' of charging cables, and there's still another in a bag in case I lose that. At my desk in the office there's one on a cable and one in my desk. There's a couple in my car's change holder as well. I'm covered. The problem with adapters is that often (without getting more expensive models) you are sacrificing the option of having rapid charge. Some how the adapter loses a little bit of that juice along the way and well... you charge 'normally' instead. For the most part, I'm okay with that. When I need a fast boost, I have a separate cable for that in my car, I have a separate charger by my computer in the den and I have a separate charger by my bedside. This is where those multi-port chargers play a great role (car, wall). Those are the times that when I really need to have a quick top up, having the dedicated cable for it makes the most sense. The rest of the time I deal with adapters. I should probably switch myself over to one of those cables that +Martin Guay reviewed from Nomad... that would be wisest, but after years of working at Radio Shack, living with adapters is not so foreign to me. Have you switched to USB-C? How have you lived with it?